Honest, heartbreaking, and often funny, "Finding Theo" is "An Extraordinary Story of Strength, Courage, and Faith" that restores faith in the goodness of people and something bigger than all of us. "An Extraordinary Story of Strength, Courage, and Faith"
On a crisp, sun-filled afternoon, Theo Krause gains speed as he drops into a ravine on a remote Colorado mountain biking trail. As he rounds a bend, he hits an awkward bump hidden in the shadows, catapulting him head first in to a lone aspen tree, splintering his neck, and leaving him paralyzed unable to move his arms or legs. Lying face up staring at the sky, he thinks, “This is where I will die.” His parents are five hundred miles away. A mountain rescue team races in while a helicopter crew positions for a dangerous airlift. Hours later Theo’s mother takes a phone call shattering an ordinary evening at home, plunging his parents into a nightmare. The news is devastating. Her son will never walk again. This is where the story might have ended were it not for the amazing resilience, courage, and faith of a young man, his family, and the extraordinary group of strangers and friends who came to his aid. What followed is now the story behind Finding Theo. 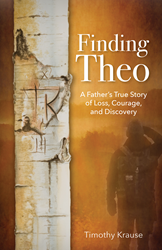 "Finding Theo: A Father's True Story of Loss, Courage, and Discovery" by Timothy Krause is a father’s raw account of his son’s courageous battle for life. It is also a deeper story of discovery about the people whose lives became interwoven with Theo’s: the son of an Iranian immigrant who found him beside the trail, medical professionals—one, the sister of a Columbine High School massacre victim—and the cast of friends, and family who guarded his soul. "An extraordinary story of strength, courage, and faith, Krause invites readers inside a family's desperate struggle to remain balanced against the determination, and independent spirit of their critically injured son," says John Donovan, Chief Executive Officer, AT&T Communications. Alana Nichols, 3-Time Gold Medalist, U.S. Paralympic Team says, "Having a family like Theo's redefines how people can think about physical, spiritual and emotional recovery after an injury.When there is love, anything is possible. Finding Theo is a testament to exactly that." Finding Theo provokes potentially life-altering questions about the meaning of “miracle” and how the world bands together to help. It is a story about humanity. It is a story about strangers helping strangers as a family struggles to return to normal. "Theo's perseverance, strength, and spirit were inspiring to me and all who encountered him," said Dr. Kirk Clifford, MD. "It was an honor and a privilege to have been a part of Theo's miraculous journey." Craig Hospital Foundation adds, "Some patients need a gentle nudge to move forward, while others like Theo are disciplined and focused on day one." "This courageous story is a reminder that even faced with what appears to be an insurmountable challenge 'giving up' is not an option!" says Jim Falk, President & CEO, World Affairs Council of Dallas/Fort Worth. To learn more, visit: http://www.findingtheo.com. Books are available online and bookstores or by visiting: http://www.findingtheo.com.